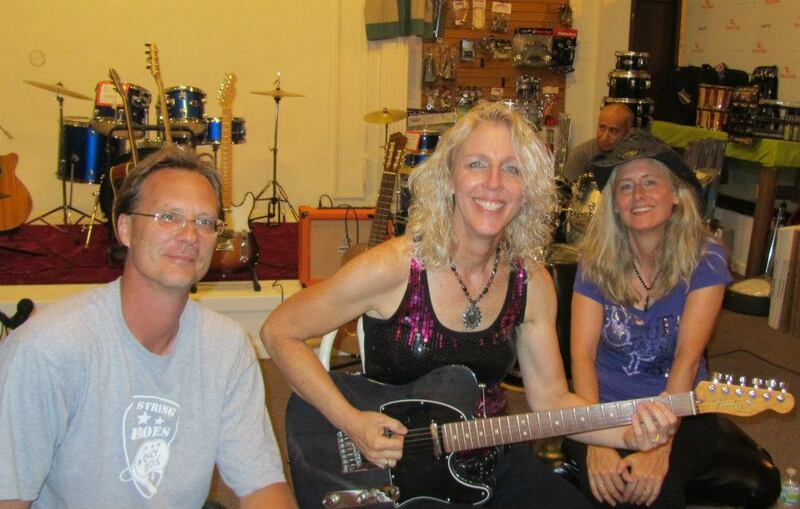 OUR SECOND STRING Music grand opening weekend started Friday night with Blues In The District. 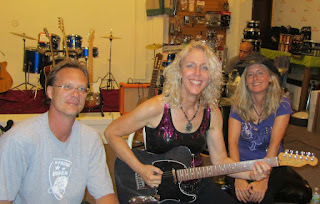 We had a boat-load of people in the store before it started, partied in the park with the awesome Laurie Morvan Band, then opened the store back up about 9 p.m.
Laurie was losing her voice and under the weather but was a trooper and a half. She played a couple of guitars, smiled and signed autographs and gave me a guitar pick I will treasure and frame. She had shows the next day in St. Louis and today in her hometown of Plainfield, up by Chicago. Sadly she has had to cancel her Plainfield gig due to laryngitis. I am sure she is in much need of a good rest. On a much smaller scale I can relate to the weekend grind. I know all she wanted to do was go to bed, but she couldn't have been more gracious and nice. Her family was with her as well and the guys and gal in her band were all smiles. Our Saturday started heating up at about 10 a.m. and it never slowed down until the end of the day. At about 2:30, the amazing Ray Burke and his Los Angeles band, The Green Almighty, came in and by then you could hardly move, and we have a pretty big store. My guess is there were 80 to 100 people sardined in Second String Music, most to see Ray and his guys. A lot of bands hide behind sheer volume and bluster. To play acoustically is to put yourself out there, and you have to be a musician, not a sledgehammer drill sargeant. Tim Neighbors has one of the best rock and roll voices I have ever heard. Patrick Eck borrowed a Dean acoustic and made it sing (and he loved the guitar too). Ray's Martin acoustic bass bottomed and drove everything and drummer Charles Eck used a washboard and a conga. They. Can. Play. And I'm a fan for life. CDs available in the store, by the way. We finally trickled everybody out of there by 6:30, power napped and headed for Johnny Bang Bang's on the river. The place was packed already by 8:30 and the three bands didn't disappoint. It's been a decade or so since Groove Stick was around, but powered by drummer Steve Cowser and singer Dennis Hibbard, they looked like they'd stepped on stage all week. Then came the much anticipated Forever reunion, a Quincy powerhouse of a band that came an inch from making it to the big-time but hadn't played here in 25 years. They tore it down with volume and energy, and I especially have to give love to Jim Bier, who played guitar with Forever because the original guitarist opted out for the reunion. Jim will be teaching guitar lessons at the store starting next month and is one of those rare guys who knows when and where to play in songs. The guys in the band seemed stunned by the huge reception they got and they sounded amazing. Finally, the Green Almighty took the stage and it was great to see so many people sticking around despite the fact it was almost midnight. It's hard to describe their sound - funky and in-your-face, groove-laced, creative, everybody on the same page, a vocalist with serious range and four guys who enjoy being on the stage. You cannot fake enthusiasm and the sheer joy of playing. They are the best live band I've seen in many, many years. All I saw on the packed first-floor were people laughing and smiling and having the best time of their lives. Ray and his guys gave us a couple of shoutouts from the stage. You can spend a lot of money on ads, but real appreciation and kind words from new friends in a packed venue are our best PR. So, as Sunday morning falls along with the much-needed rain, Sheryl and I say a huge thank you to the bands, people and city of Quincy for making our lives a wild rock and roll ride. What's everybody doing next weekend?